Previous posts have reflected on the lack of curiosity amongst students in the history of science and how we might address the issue by modeling curiosity. Subsequent conversation and comments to the first post prompted me to take my copy of Thomas Browne, Religio medici (London: J. Torbuck, 1736) into class and try to model questions. This list does not exhaust the possible questions, but focused students on the physical object and some of the publishing details. The next set of questions focused on the book’s provenance: who owned it, who read it, what did those readers find interesting? Only now did I want students to begin thinking about the content. The next section of the “Guidelines” asked students to think about the surrounding material. Where I wanted them to start was with letters of dedication, any supplementary information about the book seller, etc. Subject and survey of contents (e.g., for a book on the plague, you might find sections on sources, causes, symptoms, prophylactics, and cures. In this case, the subject would be either Medicine or Plague and the survey of the contents would be these various sections). After a discussing these guidelines, I turned to Thomas Browne’s Religio medici and tried to show students how I would answer these questions. Or how I would go about answering the questions. I also wanted to indicate some of the ways that these questions might be used to piece together a richer understanding of the book and the contexts in which the book existed. 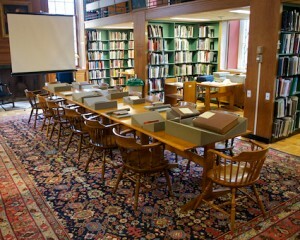 Again, the goal was to suspend for the time being any real discussion of the contents of the text. Moreover, at this point I wanted to emphasize description over analysis. Religio medici is a book by Thomas Browne. Browne was an Oxford-educated physician who became a member of the College of Physicians of London. He wrote various works on religion and nature. I pointed out to the students that the best place to turn for information about English authors is the Dictionary of National Biography . Entries often include useful bibliography and provide a starting point for learning much more about the author. For non-English authors, there are often similar national biographies that can serve as starting points. It is also useful to check the Dictionary of Scientific Biography , which includes entries for the better known scientific authors. The full title of this edition is: Religio medici. A New Edition, Corrected and Amended. With Notes and Annotations never before published. To which is added the Life of the Author. Also Sir Kenelm Digby’s Observations . It was printed in London for J. Torbuck in 1736. J. Torbuck was located in Clare Court near Drury Lane. C. Corbett “against” St. Dunstan’s Church in Fleet Street also sold the book. That the book was printed to be sold in two locations suggests that the printer probably printed it in greater numbers than if it had been sold in only one location and that the printer at least hoped to reach a broader market. This edition of Browne‘s text is small, an octavo format. Printers would often print a book in a small format in order to keep the costs low, making the text available to wider market. There are no illustrations. The annotations are set off from the body of the text, making it easy to read Browne’s Religio medici without being distracted by the annotations. The text is 253 pages and is not bound with any other texts. 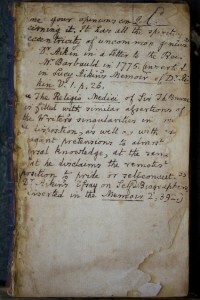 Another edition appeared in 1736, a shorter one without the annotations or Digby’s “Life.” The appearance of the two texts further suggests that there was a market for the book. I point out to the students that they can use this publication information to think about the popularity of the text. The first edition had been published in 1643, in London. That they were still printing copies, and expanding them with annotations, corrections, and biographies of the author further indicates the texts enduring popularity. Moreover, this edition was roughly the 23rd edition (including continental translations). The title page gives us a hint of provenance. A previous owner (?) wrote his name on the title page: “Cha. Biborn.” While this doesn’t offer much to go on, one place to look for information on Cha. Biborn would be the various national biographies, such as the Dictionary of National Biography for English names. Regrettably, there is no entry in the DNB for “Biborn.” Despite the initial lack of success, I tell the students, additional searches might turn up something. Then again, it might not. Such is historical research. It seems Cha. Biborn also read his copy of Browne’s text. Various marginal notes and corrections dot the text. For example, on the first page of the “Annotator to the Reader” letter, a small correction was added. 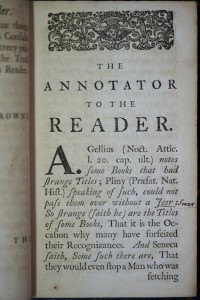 The ink and handwriting are the same as the name on the title page, suggesting that Biborn was also the annotator of this copy. The next set of questions concerned not the owners and annotators but the printers and sellers, the producers of the text. The two book sellers are noted on the title page: J. Torbuck in Clare Court near Drury Lane and C. Corbett “against” St. Dunstan’s Church in Fleet Street. We could find out other books sold by Torbuck by looking through a history of printing in England or, more conveniently, by searching one of the large catalogs such as WorldCat. Learning what other books Torbuck and Corbett sold might help us place this book within its intellectual context and might help us recover the customers who were likely to have purchased this edition. I didn’t have any histories of printing available, but I did have a laptop and an internet connection, so I searched Worldcat for Torbuck as the publisher. The results included 299 books ranging across subjects including politics, religion, comedy, and histories but not too many scientific works. Most seem to be rather small format books and quite a number were printed for Charles Corbett and John Torbuck. In 1738 Torbuck sold yet another edition of Browne’s Religio medici . This all suggests that Browne’s text was a rather popular work sold alongside other books intended for a general audience. An advertisement at the back of the book confirms this suspicion. 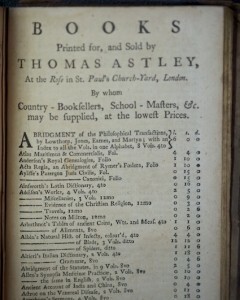 A list of books printed for and sold by another bookseller, Thomas Astley. Astley clearly identified his intended customers: “Country-Booksellers, School-Masters, &c may be supplied, at the lowest Prices.” Conveniently, the advertisement includes titles, formats, and prices. The list includes a range of texts, classical and modern philosophy, some science texts, some histories, and lots of schoolbooks. I used this list to show some of the differences between the various books—the large, multivolume folio books were expensive while the small books are quite affordable. The schoolbooks are typically smaller format, usually octavo or duodecimo, and quite inexpensive. I pointed out that the size and cost of the schoolbooks reinforced the inference that this small copy of Browne’s text was probably inexpensive. The small size also associated the text with certain types of texts. This edition of Religio medici was clearly not a luxury copy. Moreover, I encouraged the students to think about the type of reader who would be interested in the books sold by Thomas Astley, text books and other inexpensive editions. Does this help us recover the type of reader who was looking at this particular edition of Browne’s Religio medici ? By this point I was running out of time and so had to conclude by outlining where we would go next, had we the time. Finally, we would turn to the text itself, reading it to gain an understanding of the contents. I offered only a sketch of some of the themes that come up in the text: Christian faith, alchemy, astrology, pythagoreanism, magic, and hermetic philosophy. We would then want to think about this text in relation to the author’s other works. In this case, Browne wrote a number of other works, including Pseudodoxia epidemica , Hydriotaphia , Urn Burial , The Garden of Cyrus and some posthumously published works. Ideally, we would try to find a summary of these other works so that we could begin to piece together a picture of Browne’s literary career. It seemed significant that Browne’s text was still being printed 23 editions and 90 years after it first appeared. Two editions were published and sold in London in 1736 alone. How could we understand that popularity? Who was buying and reading Browne’s Religio medici? Who could afford it? What markets were more likely to encounter it in 1736? Can we see the Religio medici as a coherent part of Browne’s corpus? Do his other works combine religion and nature in the same way or are they more clearly focused on religion? And why would a physician be writing texts about religion? Focusing more narrowly on this particular text, we might ask “Why did Browne write it and what was he trying to do?” How does Browne’s text relate to the social, religious, and political climate of the time? Or, alternatively, we could ask about the reception of this text. Clearly there was a considerable reception. Could we find evidence for how and why people read the text? And how was Browne’s still popular a century later when that climate had changed rather dramatically? Why was this edition published with annotations, corrections, and a biography whereas other editions lacked these pieces? How did that change the way people read the work? 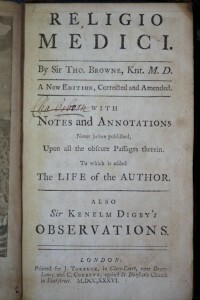 Why did Kenelm Digby write a biography of Browne? 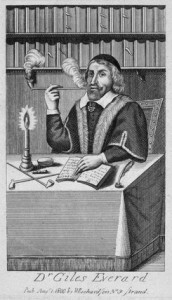 Digby was a founding member of the Royal Society and a frequent correspondent with many of the mathematicians and natural philosophers in the seventeenth century. Did this affect how contemporary readers thought of Browne’s work or does it help us understand where Browne fit within the contours of seventeenth-century intellectual and scientific culture? Does this point to a relationship between Browne and the Royal Society? What is the relationship between medicine and the more occult philosophies Browne draws on in his text? Are they in tension or do they reinforce each other? Is Browne unique in his combination of themes or is he representative? In each case I tried to gesture to how I would tackle these questions, where I would start, what sorts of specific questions I would ask, and what sorts of primary and secondary material might be helpful. Having offered this case study in how you could interrogate a book as an artifact, and having given the students a set of guidelines, I turned them loose in special collections. I hoped that they would see that there were various questions they could ask of the book when they considered it an artifact, when they understood it as having specific social, intellectual, political, and economic contexts, when they started with the book rather than the text. 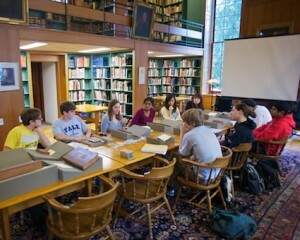 Previously, students selected a promising set of texts, inter alia G. Everard’s Panacea, or, The Universal Medicine (on the medicinal uses of tobacco), Boyle’s Experiments on the Porosity of Bodies , Agrippa’s The Vanity of the Arts and Sciences , and John Harris’s New Short Treatise of Algebra . We will have to wait and see what they do with them.